Norwich Airport has a reputation for being a friendly, easy to use airport. 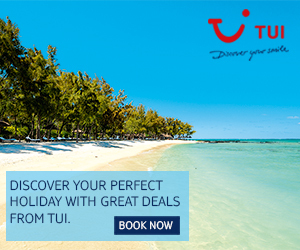 It is imperative that you discuss any special requirements when you make your travel arrangements or book a holiday. 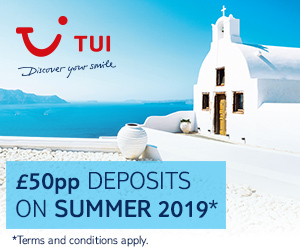 This applies to all booking methods – travel agents, websites or by telephone (Customers using an internet booking service will usually find a relevant telephone number on their websites). These booking details will then be passed to our PRM (Passengers with Reduced Mobility) facility. Any requests for assistance should be made at least 48 hours in advance of travel. We can also facilitate pre-travel visits for people with hidden disabilities such as those with autism. If you need to borrow a wheelchair whilst at the airport, please contact the PRM desk located in the main check-in hall. These are available free of charge, subject to availability. Road crossing points are clearly marked on the route from the car park. The airport is situated all on one level. Electronic sensors activate doors to the main terminal entrance and exit. There are fully equipped aceessible toilets located throughout the terminal building. Duckboards are available in all accessible toilets for customers requiring them. The boards allow a more hygenic and convenient way to aid with the changing of clothes or medical equipment without contact with the flooring. Aviation Ramp that allows easy access for wheelchairs users, passengers with reduced mobility and even children to board and disembark an aircraft with ease. Video of Aviramp. A stair climber (S-Max Amazon Chair) is also available. Video of stair climber. An EMA Loader is being purchased to facilitate the loading/offloading of electric mobility aids. Three Hearing Loops are available within the airport. A local free information point telephone is available in the arrivals area and this provides connections to airport services, travel services, local hotels and local information. Before security – at the information desk. After security – via the telephone help point located in the departure lounge. Nowich Airport has been working closely with numerous local charities to help make air travel accessible to all and improve the Special Assistance Service offered at the airport. As part of this commitment the airport is pleased to announce the introduction of a new scheme to assist passengers with hidden disabilities. From Monday 9th July sunflower lanyards will be available free of charge for passengers and any friends/family colleagues travelling with them to wear as a discreet sign to airport staff that additional support may be required whilst travelling through the airport. 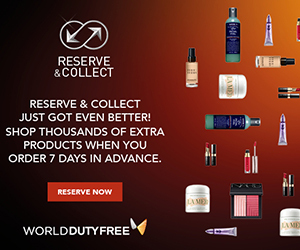 Other airports, such as Heathrow and Gatwick, are already endorsing this scheme. Norwich Airports involvement in adopting the scheme is a positive step closer to harmonising recognition of the sunflower lanyards across all UK airports. The sunflower lanyards will be available from the Special Assistance desk located just inside the terminal building. For further information on the assistance available please call please call 01603 420672. Staff that have attended hidden disability awareness training sessions can be identified by a green sunflower pin attached to their uniform. Norwich Airport’s Special Assistance team and Security staff are here to help if you are travelling with an ostomy. After seeking advice from Stomawise UK the airport has adapted its facilities with the aim of becoming accredited as an ostomy friendly Airport. Several changes have been made to the disabled toilets making them more ostomy friendly by providing facilities such as shelving, clothes hangers and duck boards with the aim of making changing more hygienic with less inconvenience. Security staff now have a greater understanding of ostomy related items that you may carry when travelling. If your person or cabin luggage needs to be searched please feel free to make use of our private search area. 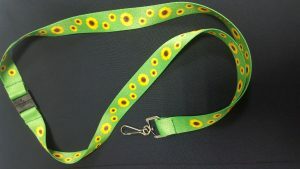 Sunflower lanyards are available free of charge and function to discreetly inform staff that you are travelling with a hidden disability. Sunflower lanyards are available at the Special Assistance desk please call 01603 420672 for further information. And other products aiding in cleaning and disposal. For further advice on travelling with a Colostomy, Ileostomy and Urostomy please see the following links. If you require your blue badge whilst on your travels, Norwich Airport can provide you with a Blue Badge Temporary Proof Slip to leave in the window of your parked vehicle at the airport, on production of your blue badge to NCP. The PRM desk is located in the main check-in area for those passengers requiring assistance who have made their own way into the terminal building. 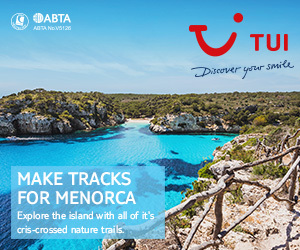 Departing passengers requiring Special Travel Assistance should attend the appropriate check-in desk before the minimum check-in time, as stipulated by the airline or tour operator, with the appropriate travel documents. Special Travel Assistance questions, based on the ABTA Checklist for Disabled Travellers, will be asked at the time of booking or at check-in. The answers to these questions will ensure that passengers requiring assistance receive the service that they need and the airport’s PRM team are made available for boarding the aircraft. Norwich International has invested in the new Aviramp system to help you board the aircraft quickly and efficiently. Check-in staff should be advised of any need for wheelchair carriage and arrangements will be made for electric wheelchair battery isolation. All special assistance passengers will be fast tracked through security and security searches can take place in a private search area on request. 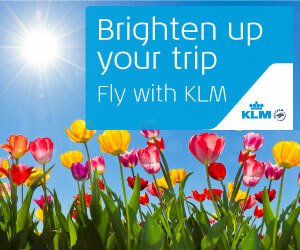 Passengers must be aware of the current airline and DfT hand baggage restrictions. Essential medical items required for the flight may only be taken into the aircraft cabin if the passenger presents a letter from a doctor confirming the requirement to security staff within the Security Search Area. Large amounts of medication should be placed in hold baggage unless the passenger presents a letter from a doctor, confirming the requirement for carriage in hand baggage at the Security Search Area. Passengers with hearing difficulties should inform check-in staff that they may need assistance. In the event of an emergency these passengers will be guided by airport staff to a designated assembly point. Special Travel Assistance passengers travelling without an aide will be assisted to the security search area and on to the departure lounge in preparation for boarding. If required, further assistance will be available prior to boarding the aircraft. Inbound Special Travel Assistance passengers will be met at the aircraft and taken into the terminal building. Passengers will be reunited with their baggage and wheelchair. Further assistance will be offered to get passengers to their point of departure from the airport. Please rate the quality of the service you received from the Special Assistance team at Norwich Airport. 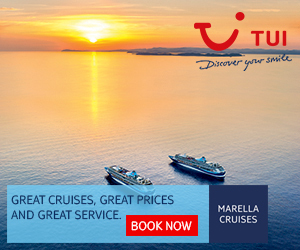 Were your needs and expectations met when travelling? Was the member of staff assisting you? Please rate the quality and quantity of facilities within the Airport Terminal. When Departing from Norwich Airport please rate the quality of Special Assistance provided from the point of arrival to the boarding gate. When Departing from Norwich Airport please rate the quality of Special Assistance provided when boarding the aircraft. 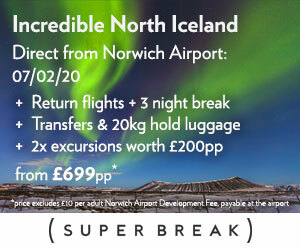 When Arriving at Norwich Airport lease rate the quality of Special Assistance provided when disembarking the aircraft. 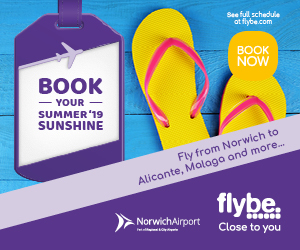 When Arriving at Norwich Airport please rate the quality of special assistance provided when being assisted within the terminal (Immigration/Baggage reclaim/Arrivals hall) and out of the airport building. How would you rate the availability and quality of equipment used to assist you when travelling? Did the member of staff assisting you take into account your disability / reduction in mobility and adapt to suit your needs? Do you plan on using the Special Assistance Service again when travelling in the future? 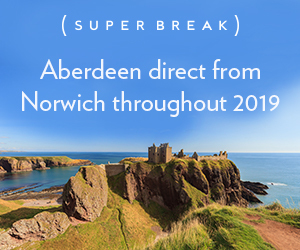 Would you recommend the experience of flying from Norwich International Airport a friend? How frequently do you travel through our Airport? What did we succeed best at when assisting you? Any suggestions to how we can improve the Special Assistance Service? Younger children requiring a familiarisation visit will also receive a small gift from the airport. The gift is a ‘Suzie/Sammy goes on an aeroplane’ book. 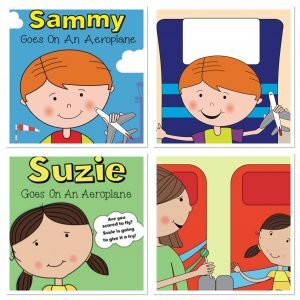 Suzie books are a series of children’s stories intended to help children cope and manage new experiences found in many families. Can Suzie and Sammy help your child when experiencing new situations? Familiarisation visits are also available to those passengers nervous about flying. We hosted a familiarisation visit for a group of local Travel Counsellors on 27 February 2019 to help increase their awareness of the facilities, adaptions and charity engagement at the airport, so that they can share their experience and knowledge with their customers when booking flights and holidays from Norwich. In 2015 Norwich Airport approached Autism Anglia to provide specialist guidance relating to Autistic Spectrum Disorder in order to improve the service provided to individuals with ASD and their families. Autism Anglia provides valuable constructive feedback and positive steps have been taken to improve the airport services. The airport signed the Autism Charter in 2017 demonstrating its commitment to aiding ASD travellers. The airport regularly meets with Autism Anglia to ensure continued improvements and airport staff also undergo specialist training in conjunction with Autism Anglia. Staff that have completed the training can be identified by Autism Anglia pins. Ten staff members recently attended an Autism Awareness course for airport staff held on 29th March 2019, which brings the total number of courses held at Norwich Airport to six. Norwich Airport will be participating in Silly Sock Day on 5th April to help raise awareness of autism within the community and to raise valuable funds for the charity. The airport will be attending the Autism Anglia conference. Autism Anglia is proud to once again be hosting this conference and information day to bring together the local autism community and share knowledge and best practice. This event is being held on Thursday 27th June 2019 at the University of Essex, Wivenhoe Park, Colchester, CO4 3SQ. The event will include key note speakers from autism professionals, a Q&A session, afternoon workshops and an autism marketplace offering over 250 delegates valuable information on other services and autism providers. Norwich Airport is delighted to have joined the Norwich City Dementia Action Alliance. The Norwich City DAA is made up of organisations who are passionate about raising the profile of Dementia in the city and driving change to make Norwich a more inclusive and friendly city for those people living with dementia and their families. 1) We will work with the Alliance to ensure our processes and services on offer at the airport meet the needs of people with Dementia. 2) Our aim is to ensure everyone has fair access to air travel and the opportunity to experience an enjoyable journey through our airport. To achieve this, we encourage passengers with Dementia and their carers to visit and tour our facilities prior to the day of travel to help. We hope this will remove any concerns or worries and give them confidence to use air travel. 3) We will embed the concept of “Dementia Friendly” with key staff receiving Dementia Awareness Training. In April 2018 Aaron Frost (Special Assistance Services Trainer) became a Dementia Champion. The intention is to provide internal Dementia Awareness training to all staff within the airport. 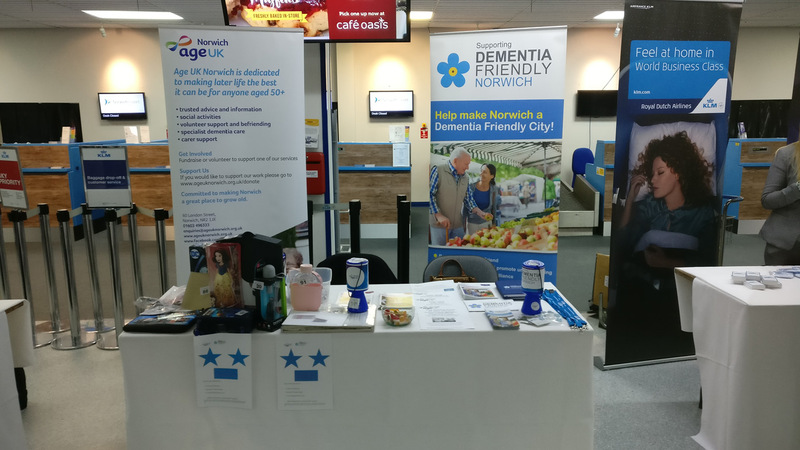 In support of Dementia Action Week, 21st – 27th May 2018 Norwich Airport attended an event being hosted by the Alzheimer’s Society, airport staff promoted the special assistance service and how our team offers support to those travelling with dementia. 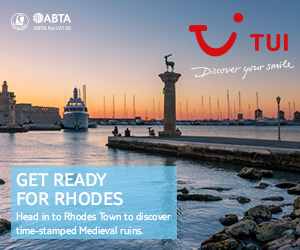 The event was actively promoted at the airport with two large banners positioned outside the entrance to the airport. Two Dementia Friends sessions will be held for airport staff at the airport. Age UK and Home Instead are placing information stands at the airport during the action week. The Dementia Action Alliance have recently published their 2017 annual report on their engagement with local businesses and the steps they have taken to become more dementia friendly. Click here for a link to the report. Norwich Airport in partnership with Age Space has produced a video walkthrough of the facilities and procedures that a customer will experience on their day of travel. 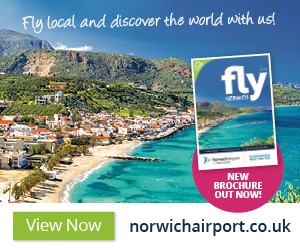 The aim of the video is to prepare customers for their arrival at Norwich Airport. “Age Space has visited Norwich airport a couple of times to talk to Jamie (Manager) and his team about accessibility for older people. The last time we visited with Age UK Norwich and filmed a dementia walk with the aim of improving the airport experience for people living with dementia. We’ve always been incredibly impressed with the foresight and effort Norwich Airport have made to make the airport an environment which is comfortable for all – especially those with accessibility problems. Age Space Please see link to Age Space’s publication on the Special Assistance at Norwich Airport. 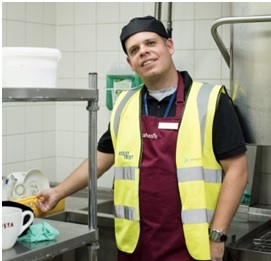 Norwich Airport is working in partnership with Assist Trust to provide internal work placements for individuals living with learning difficulties. The airport has committed to work alongside the charity by providing employment for its members with the cafe and terminal to encourage and grow their independence. These placements have proven very successful with and as a result the number of placements on offer has recently increased from three to six, with the aime to provide additional placements in the future. For further information on the airport’s partnership with Assist Trust please see here. In early 2018 Norfolk Family Carers engaged with Norwich Airport to discuss how carers, and those traveling with customers using the special assistance service are supported. Alison Easton (Adult Services Manager) was impressed by our forward thinking approach towards those travelling with a disability or reduction in mobility and commended our recent involvement with local disability charities. 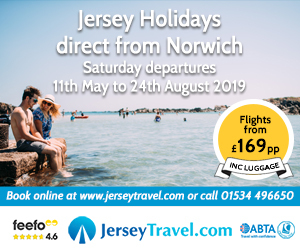 In partnership with Norfolk Family Carers the airport sponsors advertising of the charity on the flight information displays located throughout the airport. Norwich Airport has worked in partnership with AgeSpace to produce a short video walkthrough outlining the facilities and Special Assistance provided when travelling through the Airport. Registered charities are invited to contact us to promote their field, and help us to further develop our PRM services.